Lifehacker.com is one of my favorite DIY website with articles on free softwares and great ideas to improve our lives. 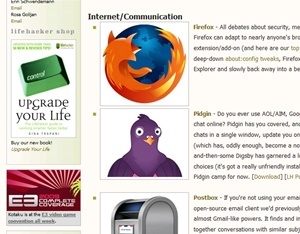 This “Lifehacker Pack 2009: Our List of Essential Free Windows Downloads” article from Lifehacker.com features the important freewares that we need in our desktop PC. From well known and ever popular Firefox – Web browser and Picasa – Image Tool, they mention about Everything – Desktop File Search Tool (Hana Sara Freeware Blog). Foxit Reader – PDF reader much faster than Adobe PDF reader and supports tab browsing. Notepad++ – Simple yet powerful text editor! However, the most interesting part is that they have a software package that includes all the softwares (except some license sensitive ones) that you can download. download the Lifehacker Pack bundle . Here is the explanation from the website. To use it, download the Lifehacker Pack bundle, extract the two files from it into a folder or onto your desktop, and then run the InstallPad app; you’ll see our must-have list ready to download and install in a snap. You can un-check the apps you already have or don’t want, install apps individually, or mass install everything you’ve got checked with one click. We included everything in the InstallPad list except iTunes, Songbird, and the Mozy backup software; the former two because they’re somewhat of an either/or choice (at least in our list), and the latter because it requires a sign-up and registration to really install and use properly.